Corin Hardy and I began our conversation by exchanging notes on T-shirts. Last Monday, I walked into a New York City conference room wearing an Amity Island tee, inspired by Jaws, which he immediately noticed. He shared that he had just gotten a new one for an Evil Dead 2 hardware store, with a chainsaw and shotgun on it. We then shifted focus and began chatting about Ash vs. Evil Dead, like two kids nerding out. I mentioned my initial nervousness about the show, and he agreed and pointed out how the trailer impressed him because it really looked like it existed in the same Evil Dead 2 and Army of Darkness universe. When I told him I'd already seen the first two episodes, and they hit the sweet spot, he might have been a little jealous. "Did you at least get to see the premiere on Saturday?" I asked. "No, it premiered on Halloween as my film was premiering at Lincoln Center, but I can't wait to see it." I snap back to interviewer mode and remember the fan sitting across from me, chatting about one of the most talked-about shows this year, is the director of The Hallow, one of the most talked about horror films this year. And, after initially debuting at Sundance Film Festival last January, it is will be available on VOD and in limited release beginning Nov. 6. 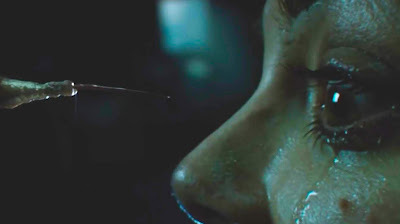 Pitched as "Straw Dogs meets Pan's Labyrinth," The Hallow is a story about a young family facing an assault from elemental forces out of the darker pages of fairy tales. Things begin innocently enough when conservationist Adam Hitchens (played by Joseph Mawle) relocates his wife Clare (Bojana Novakovic) and their infant son from London to rural Ireland. But when he ignores warnings from superstitious local Colm (Michael McElhatton) not to traipse in the woods, he runs afoul of "fairies, banshees, baby stealers" and the creatures of folktales – creatures largely created with practical effects and animatronics, and reminiscent of Jim Henson's nastier beasts. The Hallow is a horror nerd's sandbox that pays homage to classic fare such as The Fly, Alien, Evil Dead, and more. But Hardy's directorial debut also stands on its own as a horror with heart, and a fresh approach. In the lengthy conversation below, we discuss how he weaved his fascination with zombies into the new movie, and the ways traditional folk stories are represented in it. We also discuss the horror DNA at the core of The Hallow, and where Hardy might go next with the story. And before we discuss the movie's final scene (with a spoiler warning right before that question), we also touch on where Hardy is at with his new film adaptation of James O'Barr's The Crow. I was looking for a fresh area to mine. Being a big monster fan, I didn't want to repeat, as much as I love them, zombies, vampires, werewolves. There is a lot more out there. And fairies? There is a lot of ammunition, and I particularly looked at the Irish folklore. There are so many great ideas. The challenge wasn't trying to find them as much as figuring out what not to use. I wanted to do a fairy tale grounded in reality we could identify, and be scared of, and also hopefully moved by. 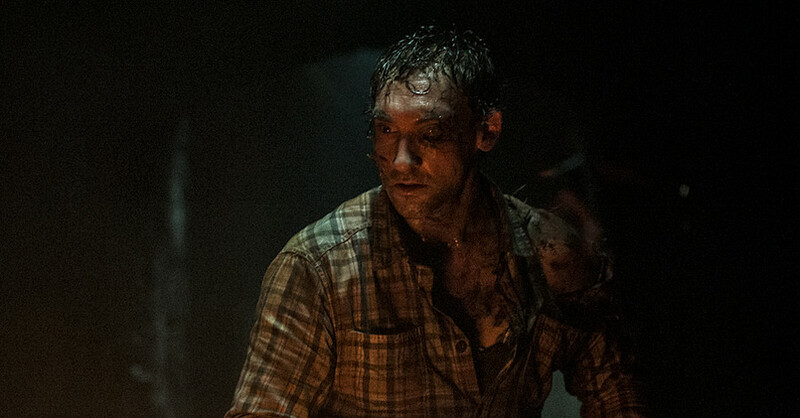 Would you call The Hallow a supernatural movie? I wouldn't want to give away the game. Part of the immersive qualities of a horror movie is guessing what the threat is. The fear comes from the unknown. So, before people see it, I don't want to pin it down too much. There are definitely supernatural ideas in it. But I know why you're asking that. Then let's talk zombies. Towards the beginning, Adam talks about the fungus that makes zombie ants. I love that, because these things are real, and ready made for horror, but I've never seen them mentioned in a movie before. It made me think this could be something of a folkloric, myth-driven zombie movie. Is this your way into the zombie genre? 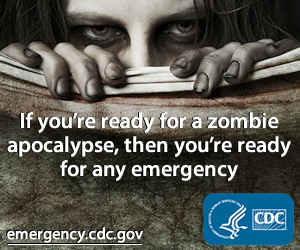 I certainly wanted to avoid the "Z" word, as much as I love zombies. I did not want to do a zombie movie, but I did want to coast a fine line between supernatural and mythological ideas, and science, nature, and body horror. And find a way they could actually exist in the same movie and ideal. What I read in research for fairy folklore and mythology lends itself towards organic settings, and those things kind of come together. At one point, the local, Colm, drops off a big, heavy-looking book with a silver cover. I wanted to pick it up and page through it. What are some of the things we might find in that? I love practical effects, and I wanted that book to feel real. There are lots of illustrations in it. Just the idea that this could potentially be the first ever fairy tale written, like a bible of fairy mythology. So, it would have rules and preventions. Some ideas I liked interpreting, one particularly, was the idea of gaining second sight. There is a term "being touched by fairies" which can lead to madness, or blindness, waking up in another place, or time. Fairies do anything to deceive you, mislead you, or tear your life apart as a human. They particularly like stealing children and replacing them with changelings. I suppose this idea of being touched by fairies, I thought maybe you're not just magically touched but, in fact, infected. So there is something biological going on. Maybe second sight is something you gain because you're adjusting and transforming in a certain way. I tried to take ideas, and also cross them in a scientific way, and look at the oldest stories of fairy mythology of this perfect race existing in Ireland, the Tuatha Dé Danann. If you Google the Book of Invasions, which was a blessing for me to find, it's like the original fairy tale. Who knows how much is real, how much is mythology? It is a great name, and purports to have the history of Ireland and the first settlers. It also has the mythology, and is an ambiguous text in Gaelic. So maybe I can interpret this book in the movie to be like a Book of Invasions that gives Clare everything they need to know. I want to address Adam's backstory. He is a conservationist but you allude to his work with the lumber industry. He's a conservationist based in London, and based on a friend of mine who works as a Dutch Elm disease inspector in the UK. His job is to go around examining forests, and whether they've become infected. There is a sort of backstory to Adam, and I didn't want to go too into it, but the idea that they've got a new baby, and having a tough time in London in this constrained flat. He has been invited out there to do a job he loves. He has probably been based in an office doing paperwork, so to get out there in this huge forest is something he's enjoyed. But at the same time, what he's doing is going to result in these forested areas being sold off – which is actually happening at the moment in Ireland as a result of the economic crisis. So, it is a little bit like a deal with the devil. 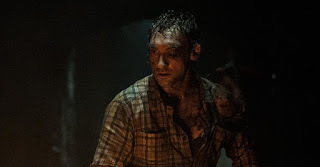 It has been interesting reading about The Hallow, because so many people are picking up on the nods to Alien, Evil Dead 2, The Shining, The Fly, and so on. Are you pleased that they see those? I'm glad. Although I don't want to overtly rip something off, I definitely wanted to nod towards my classic golden era of the best horror movies. And all those you just mentioned, plus A Nightmare on Elm Street or Pumpkinhead, are the ones I come back to repeatedly, for a number of reasons: The stories, the love given to them, the attention to something like the transformation in An American Werewolf in London. There are things I love watching, and I wanted to make a movie that was my take on that, nodding towards my inspirations but also taking different routes and keep you guessing. I'm very pleased if you see my inspirations. Are you in a place where you're thinking about the next installment? When you create a story, you can't help imagining what goes on beyond the hour and half running time. I have got ideas on where it could go, if there was another one. And that's pretty much what you see in the end-credits sequence. It sets up, maybe if this is Alien, you could maybe have the Aliens version of The Hallow part two. I would love to do some graphic novels to show a series of stories of people encountering The Hallow throughout the history of time, and different periods, as they evolve. It is something I'm definitely interested in. It can happen, no doubt. It is purely a budgetary thing at the moment. It wasn't an issue until what's happened with Relativity. Creatively, there is no doubt. We were in the thick of pre-production up until around July. We were a few weeks out from shooting. I'm waiting to get back on board and to making it. I have had a great experience meeting James and talking about this project, and getting his approval on what I want to do. This is very much coming from his graphic novel. That has this depth and poetic qualities, and a brilliant, exciting, violent, revenge-filled world. There is a lot to draw out that hasn't been seen before. It is purely a case of the companies above us getting it together … We're very far down in terms of conceptualizing and expanding the story into something fresh. At the end of the movie, we see this final page in Colm's book with a fairy father, and a human mother and child. It reflects what just unfolded. This feels like a fairy tale ending, but was this a prophecy of some sort? I'm glad you noticed that. It is something, only when I was in Korea, that someone asked about it. To me, it's really something very important. I want the audience to draw their own meaning from it. When you're watching the end of the movie, there's things I put in there. I like to think, going back to your supernatural question, you could say, by showing this final illustration, there is some supernatural fate surrounding it. There is that quality to this book and this situation. Watch the opening on the ferry, and you'll see the same composition with the family. There is a sense of destiny that, whoever these people are, it was always going to happen. The end credits add an entirely different emotional beat. We go from scary fairy tale to this depressingly real scene of deforestation courtesy of the lumber industry. It is sobering, then the black ooze of The Hallow is shown dripping down one of the trees, presumably headed towards civilization. Is the final note that this is our fault, and we will reap what we sowed? I would say so. Also, maybe I love creatures more than humans, but I like this idea that we're going about our business the way we do. But despite the climax of the movie, we're going to get what's coming to us for what we do.